Can you imagine forbidding your children to play in their yard due to poisons in the soil that could damage their brains? Or knowing that if you do allow the kids to play outside, they would likely suffer from learning disabilities or lower IQ? Of course not. Yet, that is the life that the residents of 7,500 properties in Boyle Heights and East Los Angeles. There are apps to order a ride and food and apps to find dates and dog walkers. But what about an app to help the 42 million Americans who rely on food stamps, otherwise known as the Supplemental Nutrition Program (SNAP) to feed their families? Calling an 800 number to check one’s balance or maintaining an ongoing tally of purchases are cumbersome and time consuming. Brooklyn-based Propel, a social enterprise that builds first-class software products for low-income Americans, is addressing this need. Los Angeles is brimming with social entrepreneurs who seek investors to fund businesses that promise to generate both a healthy return on investment and a positive social impact. Plastic poisons our food chain, defaces our environment, and compromises our health. The Plastic Pollution Coalition, profiled on this site under "Organizations," is committed to eradicating plastic's toxic impact on humans, animals, and the environment. Through education and advocacy, the Coalition seeks to raise visibility of the problem and to promote sustainable solutions that we can incorporate in our everyday lives. How is it that I, who didn't grow up watching Star Trek, am now a fan of its creator, Gene Roddenberry? Though he died in 1991, Gene is a new force in the Southern California social enterprise and philanthropic communities through the Roddenberry Foundation. This year, at the age of 35, something snapped. Los Angeles needs a new flag! 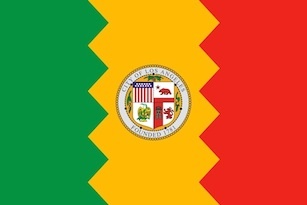 Did you recognize the image on this post as the flag of Los Angeles? Probably not. Designed and proclaimed the city's official flag in 1931, it has fallen into obscurity, visible only in city offices and courtrooms. To us at Do Good LA, it symbolizes municipal bureaucracy, not the vibrancy of our Los Angeles. Read more about Los Angeles needs a new flag!